Access control means exactly that, controlling the access of authorized and unauthorized personnel or visitors to premises and property. Good access control does this as expediently as possible. An access control system is a sophisticated yet convenient way to protect premises or buildings by restricting access without the need for a key. In most cases, the requirements for securing a door are the same, but differences based on access permissions can often change. Access Control should not be difficult or time-consuming to install and use, and this is the simple thinking ACT was developed around. ACT is simple to install and maintain, regardless of your access control experience. 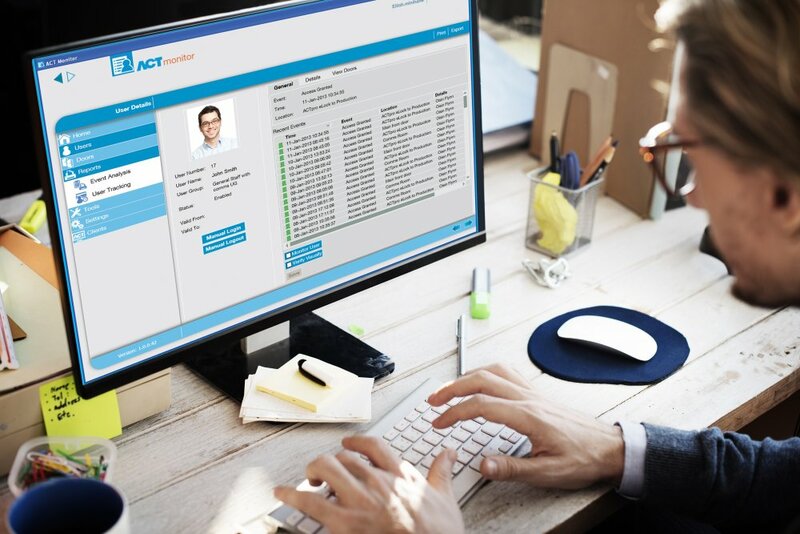 Fast to install, and more straightforward to set-up and quote, ACT removes the complexity from access control and allows you to get more done, more easily, and in less time. ACTpro is the access control system hardware that comprises web-enabled door controller interfaces and a suite of MiFare and DESfire card readers. NEW ACTpro door controllers! To complement the existing ACTpro 1500 single door IP Controller range, we have introduced a new PoE Ultra version. This means that all power requirements for local door accessories and components are delivered directly from the controller, which is powered over the ethernet. Essentially, this means less cabling, less time, and more convenience for the installer! We recognize that Access Control should not be difficult or time-consuming to install and use, and Vanderbilt has developed the ACT products around this thinking with a modular design philosophy. With its modular architecture and automatic device detection, ACT is simple to install and maintain, regardless of your access control experience. The card reader is the single most vulnerable point in your entire physical office security setup. 90% of all access control cards in the industry today are easily copied and cloned on the internet. ACT Enterprise secures your business by using the latest DESfire ™ EV1/EV2 cards and readers and Open Source Data Protection (OSDP) protocols to ensure that your cards cannot be cloned and your readers cannot be spoofed. ACT ensures installation time is kept to a minimum, You simply use one IP address and connect the controller to the network. To offer a flexible approach you can also use an RS485 structure. With simplified processes, and an intuitive “point and click” interface, both users and installers have the opportunity to utilize the benefits of ACT with minimum training or technical support. A good example of this is the rules mapping engine that enables advanced configurations of various system inputs and outputs through an intuitive, user-friendly interface. With a proven approach, ACT utilizes a single license from setup, that enables simple and efficient programming of system functions and updates. ACT was created with an intuitive handling philosophy in mind and is a user-friendly system that has the ability to provide direct messaging on OLED displays at the door (where Vanderbilt Mifare OLED display readers are installed). 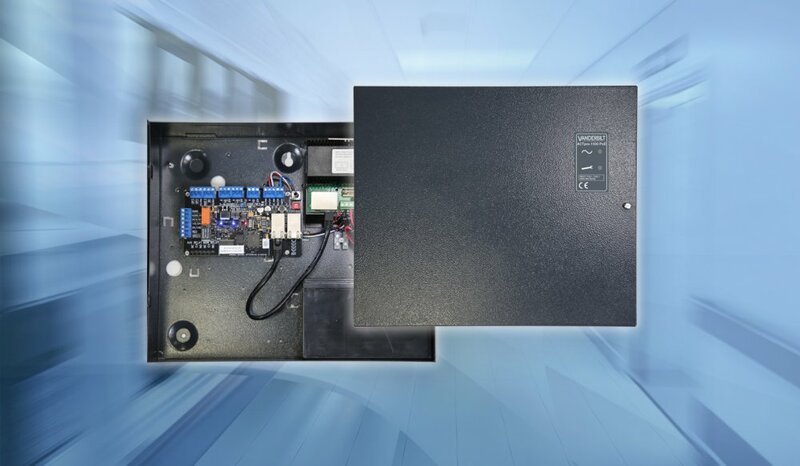 To ensure ACT is easy to quote, easy to sell and easy to install both door controllers with or without onboard PSUs are available. ACT is fully customizable should you need it to be. If customization is not required, door controllers are pre-configured out of the box, to ensure you have an operational system in the fastest time possible. Our Apple and Android compatible apps mean real-time monitoring, user management and administration from your smartphone. You can enable and disable alarms, lock and unlock doors, authorize users and check who’s in and who’s out – wherever you are. Security has never been more convenient, and you’ve never been more in control. Where is ACT Access Control installed today? The flexibility of ACT allows you to easily manage public areas and permit access to restricted areas while preventing unauthorized access. Providing a safe environment for clients and staff is a top priority for any organization. Ensure safe access and fire-safety with ACT access control. High numbers of students and staff seek access to multiple public areas, offices, sports facilities and student accommodation. ACTpro DESFire smart card solutions ensure you are using the most robust and secure technology for your campus in the most efficient way. With global threats to air and ground transport hubs ever present, real-time site-map monitoring by security staff will help ensure safety of staff and the public. ACT Enterprise software offers a scalable, multi-site solution. The highest level of security is required for government buildings, military installations, police stations and courthouses. The ACTpro range will ensure the highest level of protection against card-fraud and security breaches. Harsh environments that face many immediate dangers and extreme weather conditions, construction sites will benefit too from the robust housing and waterproofing of the ACTpro range of readers. From tens of thousands of people in your stadium on match day, controlling access from secure pitch-side areas, or a small fitness center, using entry and exit records for payment and membership, the ACTpro range is the versatile and reliable solution for you. Interlock systems controlling access to cash-offices, securing high-ticket items in stock areas, controlling supplier personnel and vehicle access can all be fully integrated using the ACTpro range. ELIMINATE UNNECESSARY COSTS - Never change a lock again if keys are lost or stolen. CONVENIENT - Easily disable cards or fobs from the system to deny staff or ex-employees access when appropriate. SECURE DOORS - Doors can be set to automatically lock when closed. CONTROL ACCESS RIGHTS AND TIMES - Decide when and where staff have access. REPORTING - Know the who, when and where within your premises. Run reports on events, time and attendance and audit trails. MUSTER LIST - Keep an accurate list of all employees on site in the event of a fire or emergency. Want to purchase ACT Enterprise?